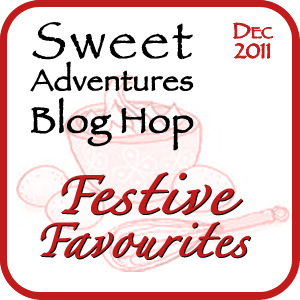 I got excited when the hostesses of the Sweet Australian Adventures announced another blog hop with the theme Festive Favourites early this month (with this month's host 84th and 3rd). So excited that all visions of sugar plums danced in my head. Well, not quite exactly those but all these Filipino festive favourites - bibingka (native rice cake topped with cheese or salted eggs), puto bungbong, leche flan, buko pandan and the Filipino tropical fruit salad. But getting carried away is my middle name. I had bought all the ingredients to make the bibingka but never quite got to make it after my macadamia obsession and the endless caramelizing demand got the better of me. It's the silly season after all. So after careful bibingka planning even to the extent of buying 3 packs of banana leaves, I've taken the easier route. To spread some green pandan happiness. No baking involved. Just a lot of chilling and stirring. Cool, right? This is a favourite in our home but I've never quite gotten to actually making it. In Manila, my brother in law has a special supplier where he gets tubs of these for parties. And its totally the best there is. But we don't have Nathaniel's here so making the salad dessert was the challenge of the day. If you're keen on making this, you'd have to make a trip to your local Asian or Filipino shop, if there's any close by and get some: nata de coco , buko pandan essence and Alsa Green Unflavoured Gelatin. And while you're there, you can also check if they have frozen pandan leaves and frozen young coconut strips. Otherwise, you can take the challenge further and get some fresh coconut from the market. To make: First stop - gelatin. Prepare according to packet instructions and quantity - using a small pot boil the water with 3 pandan leaves. Add the gelatin mixture and continue to mix until gelatin has dissolved. Remove pandan leaves and pour into molds. Chill for an hour or until just set. Once ready, gently cut into small cubes. Set aside. In a large bowl, pour the drained young coconut strips. Add the nata de coco, condensed milk and cream. Stir gently to mix the ingredients together. Add about some drops of the buko pandan essence (about a teaspoon but not too much as it can be overpowering) and the chilled gelatin. Gently stir as you don't want to ruin the pandan gelatin. Pour into plastic recyclable containers and freeze overnight. Thaw in the fridge for an hour or more before serving. One can't get enough of green happiness, I reckon! Especially during the silly season! A very merry Christmas to you all! I wish you all a festive feast shared with family and friends! And if you're in Sydney during the Christmas break, why not drop by and share some Filipino festive favourites. You might also like to belt out a few songs with the karaoke/videoke. We do have a magic sing at home! This is a blog hop. Click on the links below to see all amazing festive desserts created by other food bloggers arounds the globe! Thanks for joining us Bambi and Merry Christmas! It's great that you can find all the ingredients here. I need to look for those young coconut strips - yum! Gorgeous. I love pandan. Love your step by step photos and instructions too. Season's Eatings. Oh wow. I love the flavours of pandan and coconut. This looks so bright and green but I imagine the flavours would actually be quite subtle - am I right? @Christina @ The Hungry Australian Thanks for your lovely comment Christina! Yes, the combination of young coconut with pandan's a bit subtle, but the pandan essence comes out like a star. I was thinking to add a bit of coconut cream next time. @Nic@diningwithastud Thanks Nic! You don't have to drive all the way to Cabra. I found the young coconut strips from Manila Mart in West Ryde, just infront of the train station. There's also a Filo shop in Chatswood Lemon Grove, not sure if they have though. @JJ @ 84thand3rd Thanks for hosting the December blog hop JJ! These hops are great to break the routine of blogging! Excited to know what's in store next month! @Bizzy Lizzy's Good Things Thanks Lizzy! Hope you had a lovely holiday too!